This cute little bird house is made of wood and is made by birding specifications to attract wrens and chickadees. The hole size is made to prevent larger birds from nesting inside, and will allow smaller birds to enter. There is no perching place in front so sparrows will not be attracted. This little birdhouse comes with a ventilation hole on top., and comes fully assembled from the box. The bird house is fully functional from the start and you just need to hang it in a nice place. 1 1/8" entrance hole is made to attract small birds like wrens and chickadees. This wren and chickadee bird house is not equipped with a cleaning hole, so you will just have to shake the dirt out of the hole at the end of the season. The wrens are good tenants and do a very good job of cleaning out houses before they nest every season so you don't really have to do that .There is one drainage slot at the bottom of the bird house for rain. The bird house comes with a strong cable that is simple to hang. You must find a quiet and safe place away from to much noise or movement. Next to a tree or a shed is the best place, so birds feel some protection from predators. Birds love bushes and trees near for quick getaway. Place the bird house between 1.5 and 7 m high for best chance of attracting the birds. Chickadees love to nest at that level, and will visit the bird house soon. Make sure you put it up well before breeding season. Chickadees are especially attracted and will come to a bird house when it is filled with sawdust or wood shavings at the bottom. Check the proce of Audubon Traditional Wren House here. This is an Audubon cedar wood wren and chickadee bird house. It is made specially to attract these types of birds to your back yard. It looks sturdy and well made, measures 6-1/4-inch by 6-3/4-inch by 11-inch. The birdhouse is made from natural and strong cedar wood, and will last for years. The entrance hole is made to attract wrens and chickadees and large birds will not enter. Its features an nice ventilation design and lots of air. Te cleaning is very easy, just lift the latch of the door and clean the house. In fact one of the most easiest bird houses to clean. You can clean it at the end of the season. The placement of this wren and chickadee bird houses are best in shade, away from direct sun. Birds will not come if the house is exposed to sun as the birds can over heat. Hang it next to a tree, on the barn, shed or house. It is good to have some green bushes or trees next to it so birds can fly to them and rest. Birds love to feel safe and have a place to run if danger comes. If you place the house in to much open space you will not have visitors. Don’t place the bird house next to a bird feeder, as to much movement can scare the birds. It is good to have a bird feeder in the same yard, as this will help you attract birds, just not to close to the birdhouse. 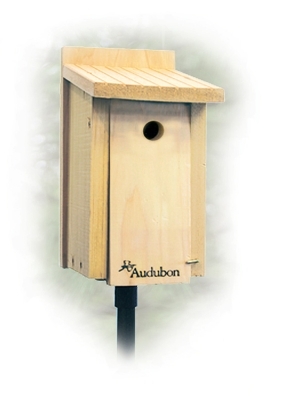 Check the price of Audubon Cedar Wren and Chickadee House here. I hope you liked this wren and chickadee bird houses review!